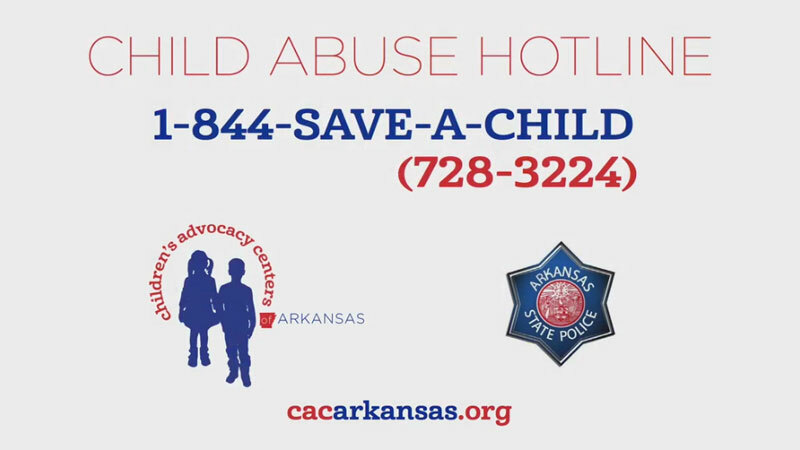 If you suspect child abuse and neglect in Arkansas, please call 1-844-SAVE-A-CHILD (1-844-728-3224). The Hotline Call Center is staffed by a team of specially trained personnel from the Crimes Against Children Division of Arkansas State Police. An investigation may ensue based upon reports which meet the criteria of state and federal laws. Reports of child maltreatment can be reported by anyone, 24-hours a day, seven days a week, through two toll-free phone numbers 1-844-SAVE-A-CHILD (1-844-728-3224) or 1-800-482-5964. - The facsimile transmission number is (501) 618-8952. - Mandated reporters may also contact their nearest child advocacy center in Arkansas to obtain live training provided at no charge (Find a CAC). Last year, Arkansas’ hotline reporting system received a call on average every 8 minutes.